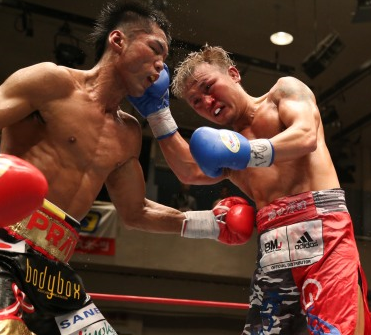 Numata claims OPBF Light Middleweight crown! The men were fighting for the second time this year following a split draw back in March and this time time Numata had promised to claim a clear win. He did just that as he stopped his foe in the 10th round of their bout and again showed off his impressive power breaking down one of the toughest competitors in the division. The started competitively and through 4 rounds there was little to really separate the two fighters. Although 2 of the judges favoured Numata through 4 rounds by a score of 39-37 no one would have complained at the other judge who had the bout even at 38-38. Through the middle rounds Numata started to run away with the action, he took the best shots of Shimokawara and walked through them before responding with his heavier shots which slowly took their toll on the taller man. By the end of round 8 Numata was in the lead on 2 of the scorecards, 78-74 and 77-75, whilst the other judge still had the bout level, 76-76. Going in to the championship rounds Numata turned up the action as Shimokawara began to struggle and early in round 10 the referee stepped in to save Shmiokawara who was struggling after a big body shot from Numata. With this win Numata has become a 2-time champion having previously held the Japanese Welterweight title. Sadly for Shimokawara this leaves him 0-1-1 in title fights. Koji Numata Vs Takehiro Shimokawara II signed! Earlier today it was announced that Japanese boxing fans would get the chance to see a rematch between Koji Numata (21-7-2, 16) and Takehiro Shimokawara (19-8-3, 6), two men who drew when they fought in a enthralling contest earlier this year. 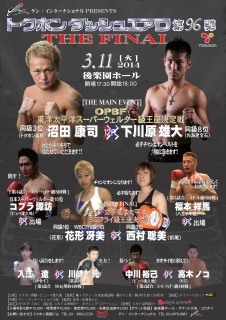 The men, who fought a genuien thriller back in March, will be fighting each other for the vacant OPBF Light Middleweight the same title that they were fighting for earlier this year. The bout has been announced for August 18th at the Korakuen Hall and is a surprising return to the ring for Numata who was thought to have retired following the first bout with Shimokawara. We're hoping that this one can live up to the excitement and action of the first contest which was genuinely great action. Although we've not heard about any of the undercard bouts we're just really excited to be able to bring you the news about this potentially thrilling contest which promises to see two men looking for a career defining win. Earlier this year Charlie Ota vacated the OPBF Light Middleweight title realising he was too good to be defending it and that he should instead be focussing on getting more meaningful world level bouts. Whilst that may have seen the title losing a high quality champion it didn't stop high quality matches, like the one fans got treat to earlier today. The fight in question took place at the Korakuen Hall as Koji Numata (21-7-2, 16), the #3 ranked, fought compatriot Takehiro Shimokawara (19-8-3, 6), the #8 ranked challenger for the vacant title. Whilst the rankings of the two men were notably different their effective skills, will to win and talent were equal and the men had to settle for a split decision draw in what was one of the most competitive and well fought bouts this year. As soon as one man thought he had the initiative the other came back and took the following round with newly found vigour to win. Whilst both men could have made a legitimate claim to have won the bout it would have been harsh on the loser and thankfully the judges, between them, came to the right decision in a great bout. Although the draw keeps the title on ice so to speak it was also a fair decision. Unfortunately for Shimokawara we don't expect to see him getting an immediate second chance and instead we'd expect two other top contenders, such as Australian based Taiwanese fighter Yao Yi Ma or the newly crowned Japanese champion Takayuki Hosokawa to be fighting for the title. As far as thoughts towards a rematch go, it seems highly unlikely with Numata reported to have announced his retirement after the fight. Although he failed to win he did put on a great fight for the fans who will be happy to remember his effort here.